A little-known fact about Portland, even to its residents, is that the largest public space in the central city is the Willamette River, comprising 490 acres (16 percent!) of the area. Until the 1960’s, the Willamette River was dominated by industry, but thanks to decades of clean-up efforts, it is now safe for swimming in the summertime. 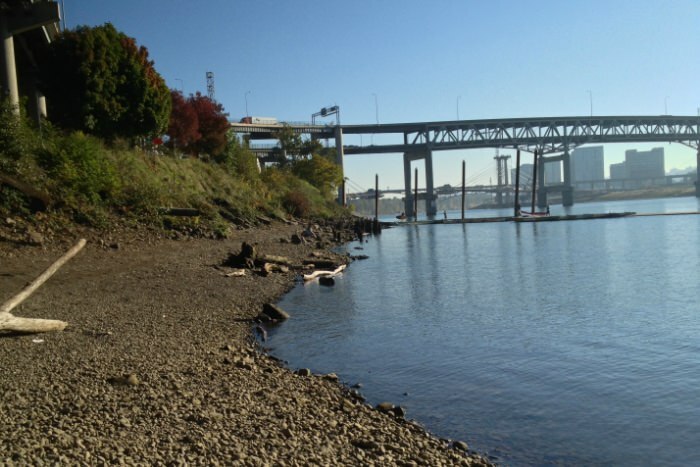 There is a grassroots movement underway in Portland, led by the not-for-profit organization Human Access Project (HAP), to create better access to the water’s edge of the Willamette River. Once a transportation corridor for commerce, the Willamette River is now emerging as Portland’s own gigantic swimming hole. If you’re visiting the Rose City from June through September, you’ll have the chance to swim in Portland’s “reclaimed swimming hole.” In the summer, the Willamette River’s water temperature ranges from 65-73 ºF and the water current is less than a half-mile an hour. Remember to always wear water shoes when swimming in any river and please bring an extra bag to pick up any trash you might find. I recommend four great river hangouts in downtown Portland, which are transforming from humble beginnings to world-class public spaces, and an immensely popular annual float event. With a poetic pathway and sandy shore, Poet’s Beach is the perfect spot to relax and write some riverside prose. 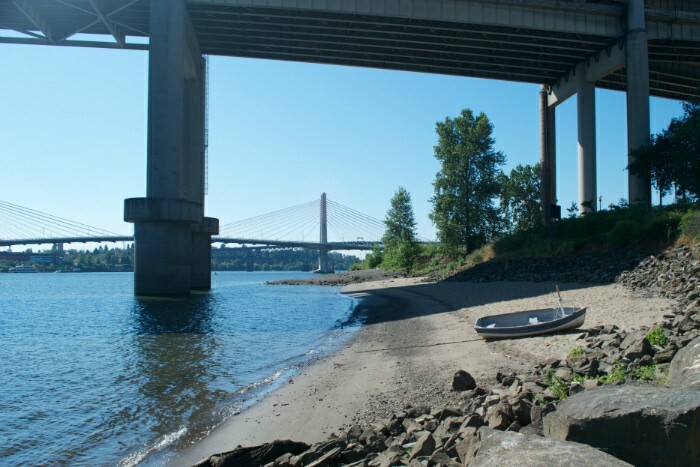 In 2014, the Human Access Project re-imagined an overlooked beach under the Marquam Bridge on the west side of the Willamette River. This area had no official name, so HAP nicknamed it “Poet’s Beach,” referring to the 30 excerpts of children’s poetry that was inscribed on rocks lining the pathway leading to the river. Also inscribed on the trail’s rocks are 11 words provided by the Confederated Tribes of Grand Ronde with their traditional Chinook spellings, English phonetic pronunciations and English translations. This tribute lets visitors learn some words of the people whose villages first inhabited the river banks of what is now downtown Portland. Poet’s Beach is a great place to bring younger children, due to its nice sandy shore and gradual grade into the water. Be forewarned this area is a little silty, so don’t be surprised when your feet sink in the sand a little when you get into the water. Pack a lunch, put on your suit, bring a pen and paper and take a dip. After you take a swim and relax, perhaps you will be inspired to write some riverside poetry of your own! The beach has a great view of Portland’s newest bridge Tilikum Crossing, the first major bridge in the U.S. that is closed to car traffic. Poet’s Beach can be accessed directly from the Westside Esplanade Trail along the Willamette River. 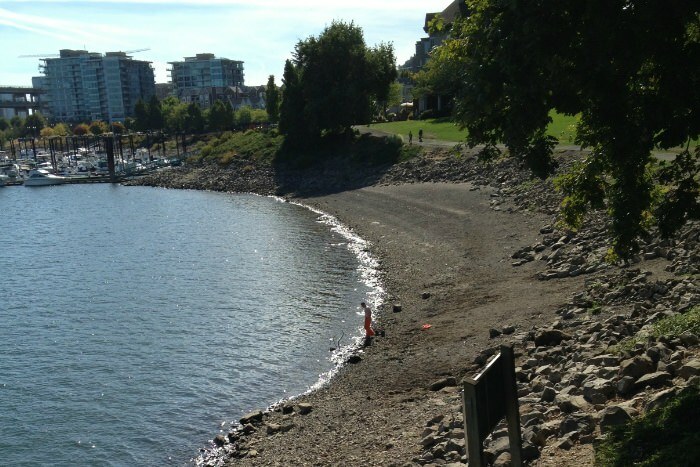 From downtown, simply walk to the Westside Esplanade and walk south. The trail ends at Poet’s Beach, so you can’t miss it. From Pioneer Courthouse Square, it’s about a 20-minute walk. Named after Oregon’s most famous governor, the Tom McCall Bowl Beach was transformed from rocky shoreline into a picturesque swimming spot. 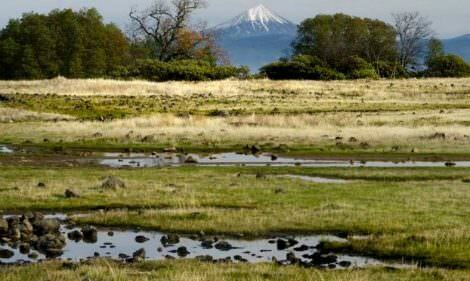 Tom McCall is Oregon’s most famous governor. In the 1960’s, Gov. McCall spearheaded the clean-up of the Willamette River when many felt like it was an impossible task. Today, there is a special urban beach named after the governor, the Tom McCall Bowl Beach. The beach was once covered by angular rip-rap rocks which migrated from the banks of the Willamette River to its shoreline. HAP knew there was a beach under all that rock, so the group organized “UnRock the Bowl,” coordinating volunteers to move 5-25 pound rocks from the beach to the river bank. The effort took more than four years and resulted in an entirely new beach area. 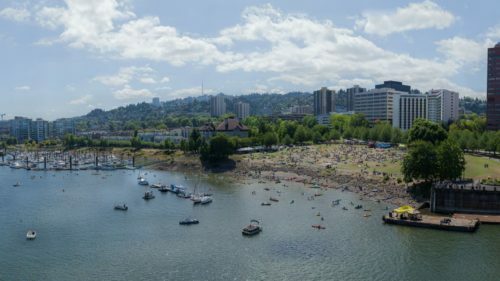 Now, the Tom McCall Bowl Beach is the starting point for The Big Float parade and where the annual Waterfront Blues Festival is held. The Tom McCall Bowl is located on the Westside Esplanade Trail, adjacent to Riverplace Marina. Currently, there is only primitive river access, so be careful as you approach the beach; the banks can be a little slippery and steep in some places. But the little bit of work is worth the reward when you sit on a chair at the banks of the Willamette River just steps from downtown Portland. The Tom McCall Bowl Beach has a mix of sand and gravel shoreline with an easy gradual grade into the river. Once in the water, be aware that this section of the river is also a little silty and your feet may sink a little. There are a number of restaurants in the Marina District, including RiverPlace Hotel’s Three Degrees Restaurant, which has seating overlooking the Willamette River. Poet’s Beach is just a 5-7 minute walk south if you want to hit Portland’s two west side beaches in one outing. The Audrey McCall Beach provides a great view of downtown Portland and is walking distance from trendy east side eateries. Located on the east side of the Willamette River just south of Hawthorne Bridge is a beach nicknamed after Gov. McCall’s wife, Audrey. It has been in the making for several years, ever since HAP volunteers started removing concrete, glass and debris from the riverbank. In total, HAP removed 19 tons of concrete without the use of heavy machinery (as required by the eight agencies that had to approve the work). This natural cove is an easy place to get into the river and features a nice shoreline comprised of sand and smaller river rock. You can also enter the water with a dip from the dock where kayakers, canoes and stand-up paddleboarders often launch. The Audrey McCall Beach provides an awesome view of the city and is easily accessible from downtown with a leisurely stroll across Portland’s iconic Hawthorne Bridge. After taking your soak, you’re within walking distance to some great Portland eateries, including Water Avenue Coffee, Bunk Bar, Hair of the Dog Brewery and Boke Bowl. 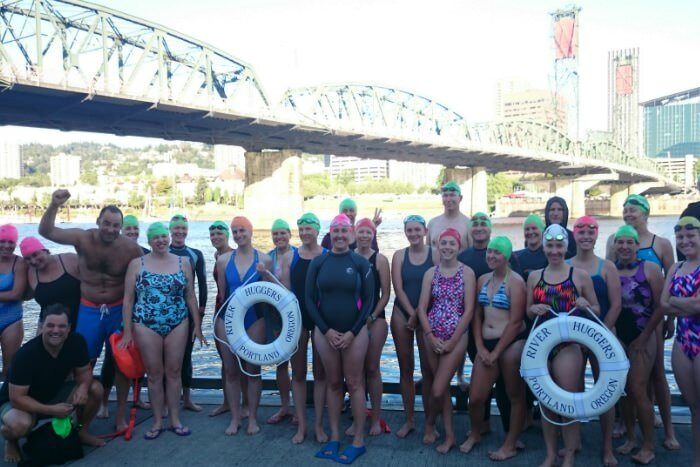 The River Hugger Swim Team hosts swims across the Willamette River, starting at the beloved Fire House Dock. In 2016, working in conjunction with Portland Fire and Rescue, HAP added a ladder to a dock just north of the Hawthorne Bridge attached to Fire Station 21, commonly referred to as “The Fire House Dock.” Before, this area had little attention, but with the addition of a ladder, viola, a new swimming spot was created. It’s hard to beat the sweet release and splash from hopping off the deck. The Fire House Dock is also the launching point of HAP’s own swim group, the River Hugger Swim Team. 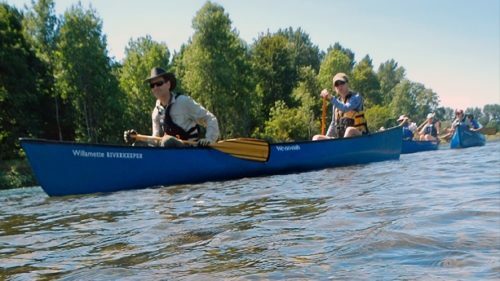 From mid-June to September, for a $5 donation ($15 for the first time or $60 for the season), you can swim across the Willamette River with the supervision of safety paddlers and 30-40 new friends. Swimmers who are at the intermediate level or above are welcomed. It’s a quarter mile in each direction. You can swim one way and walk back across the Hawthorne Bridge or do a round trip. Experienced swimmers tend to do two round-trip laps, adding up to a mile. If you love swimming and are looking for a unique view of Portland from the water (including under the Hawthorne Bridge), consider coming out for a River Hugger swim. Every year, hundreds of Portlanders participate in The Big Float, a massive summer beach party. 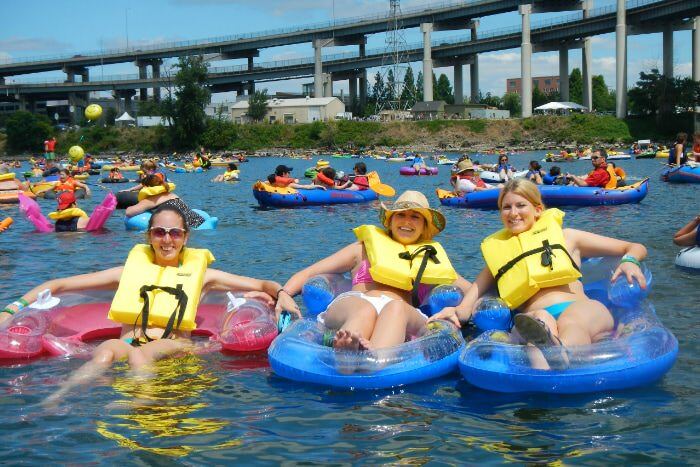 If you’re lucky enough to be in Portland during the second weekend of July, you can participate in Human Access Project’s celebration of the Willamette River, The Big Float (or as locals call it, TBF). The Big Float is a public parade, float and after-party that draws thousands of river revelers to the Willamette River in downtown Portland. Many participants dress in costume; all participants wear smiles. TBF begins with a quarter-mile parade from Tom McCall Bowl (the float take-out) to Poet’s Beach (the float put-in), led by a 15-piece marching band. Once in the water, participants can enjoy two floating band barges on the river. During the after-party, they can take turns on two 75-feet slip and slides, receive free chair massages, take in the main band barge from the vantage of their inner tubes and, of course, indulge in Portland food carts and adult beverages. Life jackets are required (and available for purchase), and no alcohol is allowed on the river. The event is supervised by hundreds of safety kayakers, the U.S. Coast Guard and the Multnomah County River Patrol. Cost is $5 in advance and $10 day of TBF, with all proceeds going to support Human Access Project. Learn more about Human Access Project with the “One City: Many Futures” presentation from the 2018 Design Week Portland.